Second-year students in the MFA Fashion Design and Society program present their work publicly each year, attracting industry and press attention. NOW MORE THAN EVER, DESIGN is DRIVing CHANGE. REIMAGINE THE FUTURE—AND DESiGN’S ROLE IN IT. Parsons School of Design—recently named the Best School for Art and Design in the United States and ranked second in the world 1 —has offered innovative approaches to education since its founding in 1896. Today we’re the only major American art and design school within a comprehensive university, The New School, which also houses a rigorous liberal arts college, a progressive performing arts school, a legendary graduate school, and other renowned programs. Here you can master established creative practices or advance emerging ones and study across all university disciplines. Surrounded by fresh perspectives and the university’s extensive resources, you research and practice in broader, deeper, and more forward-looking ways. And guided by Parsons’ faculty, you produce work that reflects human needs and responds to the call for innovation and change. Through creative and critical thought and action, you work to improve the world by design. Quacquarelli Symonds World University Rankings (2018), a London-based global provider of specialist higher education and career information. Ranking based on feedback from both academic peers and employers. »»School of Art and Design History and Theory (ADHT) »»School of Art, Media, and Technology (AMT) »»School of Constructed Environments (SCE) »»School of Design Strategies (SDS) »»School of Fashion (SOF) This organizational structure supports Parsons’ educational mission, and its interdisciplinary approach builds community among students and faculty in related disciplines. A Community for Learning Parsons, like The New School as a whole, is a community made up of people representing a wide range of identities, backgrounds, and academic and professional practices. Parsons students come from all 50 states and more diverse in the country. At Parsons, collaboration between individuals of varied perspectives and backgrounds enriches the overall educational experience and prepares students to communicate and build relationships within an increasingly global workplace. An Urban Focus Cities are models of sustainable living because of the efficient resource use and forms of community life that are possible in densely populated areas. New York City is an ideal setting in which to study the ecologies of urban environments. The city also offers opportunities to explore emerging areas, such as the design of services and new entrepreneurial and business models. Parsons instructors are part of the city, too; most are working professionals who practice the disciplines they teach. TOP: Parsons Paris offers degree programs and short courses that apply Parsonsâ&#x20AC;&#x2122; renowned curriculum in the Parisian context. MIDDLE: Parsons Festival is an annual event that includes exhibitions of student work in all disciplines. The festival brings together the academic community and the public to celebrate and explore design practice. BOTTOM: Designers at Parsonsâ&#x20AC;&#x2122; PETLab gaming incubator and residents of St. Louis, Senegal, created a game to develop systems addressing climate related disasters for the Red Cross/Red Crescent. Versions of the game have been tested in Namibia, Kenya, Indonesia, and the Philippines, and the project was presented at the UN Climate Change Conference. 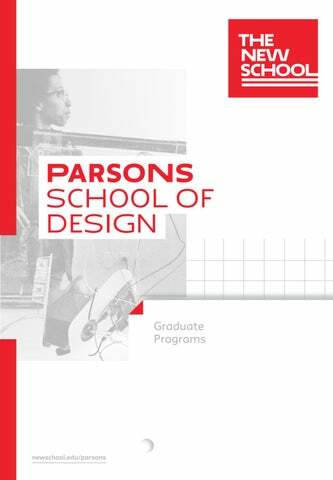 professional experience needed to be competitive for entry into a graduate degree program at Parsons, explore our AAS offerings at newschool.edu/ parsons-aas. Fields of study include Fashion Design, Graphic Design, Interior Design, and Fashion Marketing and Communication. Graduate Minors The New School is launching a suite of university-wide graduate minors, including Design Studies and Impact Entrepreneurship. These new curricular offerings dissolve walls between disciplines and provide a structured, accessible way for graduate students to complement their primary course of study and research. New graduate students are encouraged to discuss graduate minor options with their advisors once they begin their studies. Continuing studies through open campus offers open enrollment courses with Parsons, enabling non-degree students of all ages to build portfolios, take art and design courses for credit or on a noncredit basis, or pursue certificates. Intensive courses for undergraduate and graduate credit are offered each summer on the New York campus and in Parsons programs abroad. Some courses are offered online. newschool.edu/parsons-continuing-studies newschool.edu/parsons-summer opencampus.newschool.edu Study Options at Parsons Paris The New School’s Parsons Paris campus offers courses, programs, and study abroad opportunities, enabling students to benefit from our pioneering approach to learning in an intimate setting in a European capital. Our exclusive partnerships with the city’s premier art and design organizations, such as MAD (Musée des Arts Décoratifs), give students unique learning experiences. Parsons Paris offers a Master of Arts program in Fashion Studies. newschool.edu/parsons-paris Global Opportunities Parsons graduate students come from around the world. Over the past few years, we have received applications from every state in the United States and more than 100 countries. Once here, students participate in projects with a global focus, show work abroad, and take courses overseas, developing their critical and creative abilities and gaining valuable experience. FACING PAGE: Taylor Rodriguez, product series and app, FitNest. FitNest transforms living spaces into sites of wellness and exercise through rearrangeable climbing holds, shelves, and grid panels that attach to walls, making them scalable furniture. The app employs augmented reality to depict new climbing routes on the basis of the userâ&#x20AC;&#x2122;s preferred difficulty level. Complementing the wall and app are other FitNest implements that hold fitness gear, enable users to power devices through physical activity, and support tablets for viewing exercise videos. TOP: Students in the Design Workshop created new lockers and changing room pavilions for the Sunset Park Recreation Center and Pool in Brooklyn. BOTTOM: Jordana Maisie Goot and Mochi Liu, project for spring 2013 Housing Studio. level rise and storm surge. volumes, public spaces, and urban design. site, context, structure, and construction. Photography, and MS Data Visualization. TOP: Diana Mejia, Compass. Using data about favorite local sites, Compass generates new travel routes that guide users to overlooked intriguing urban highlights. MIDDLE: Alex Lardaro, Well Spent. This online tool promotes reflection on the value of timeâ&#x20AC;&#x201D;and resulting behavior changeâ&#x20AC;&#x201D;through sharing of user responses to time-related questions. BOTTOM: Husani Barnwell, Power Up Fitness. This digital product enables users to track workout goals, view lifting techniques in AR format, and connect with other gym goers in real time. visualization and related career paths. experts to turn data into insight. lively environment in which to address these challenges. design, physical computing, game design, new media art, digital fabrication, data visualization, and critical design. Candidates build ideas through prototyping, synthesizing research and practice. Graduates embark on careers in creative, academic, commercial, and educational fields that engage with the growing influence of technology. In Collaboration Studio courses, students work with industry firms and nonprofits on real-world projects. Past partners include Apple, Eyebeam, gameLab, Human Rights Watch, Mozilla, NASA, the Red Cross, Samsung, and the Whitney Museum of American Art. Students collaborate with peers from other schools and colleges of The New School, a progressive urban university emphasizing civic engagement. MFA DT resides in the School of Art, Media, and Technology at Parsons, alongside programs in Communication Design, Fine Arts, Photography, and Data Visualization. Students supplement core courses with electives offered throughout Parsons and other schools and colleges of The New School. TOP: Data Cafe, a multidisciplinary project installed at a recent Parsons Festival, invited visitors to consider alternatives to the present-day data-driven economy. MIDDLE: Ramsey Nasser, Zajal. Zajal is a programming language for artists and hackers. BOTTOM: Manuel Rueda Iragorri, SCALE System. SCALE (Self Constructing Auxiliary Living Environment), an automated disaster response system, consists of flat-pack housing modules and a robot that assembles them. FACING PAGE: Dong Yoon Park, Typography Insight. This app brings traditional typography teaching methods to tablets. TOP: Students participated in a studio project as part of their study abroad research in Brazil. They drew on studio design skills to develop their collaborative urban initiatives. MIDDLE: An on-site visit sparked discussion of the impact of the countryâ&#x20AC;&#x2122;s first housing cooperatives. Planning and design schemes that lead to sustainable, equitable cities are central to the programâ&#x20AC;&#x2122;s course of study. BOTTOM: The Sunset Park Gazette, a community publication collaboratively developed by students and local residents. Design skills enabled students to communicate about complex urban phenomena to audiences ranging from community members to academics to public officials. in self-directed projects supported by the fashion industry. Kanye West for Adidas, Ralph Lauren Collections, Everlane, St. John, Burberry, Donna Karan International, Calvin Klein, Martin Greenfield Clothiers, COACH, GAP, Reed Krakoff, and Narciso Rodriguez. In addition to working for top firms, many of our graduates go on to start their own high-profile labels and brands. The program was initiated with the support of Parsons alumna and designer Donna Karan and has received further support from major names in fashion such as LVMH, Kering, Diane von Furstenberg, the Swarovski Foundation, and Uniqlo. TOP: Shown here are selected looks from the 2017 Thesis Collections (Generation 6) by program graduates (from left to right): Zoe Champion, INLAY; NIHL (Neil Patrick Grotzinger), Masculine Effeminacies; Caroline Hu, That Moment. ABOVE LEFT: Ruby Hoette â&#x20AC;&#x2122;12, graduate exhibition at Li & Fung, New York. ABOVE RIGHT: Yong Guo, Hualei Yu, Moana Mao, presentation board for a fall 2017 Design Studio 1 collaboration with Rikers Island, NYC, Homeless But Not Hopeless. TOP: BIAS is the annual student-run publication of the program. Issue themes have included Fashion + Violence, Fashion + Celebration, Fashion + Politics, Fashion + Surveillance, and Fashion + Healing. BOTTOM: MA Fashion Studies students have the opportunity to work with pieces from Parsonsâ&#x20AC;&#x2122; Fashion Study Collection. Musée des Arts Décoratifs and the Palais Galliera (see page 13 for more information). individual within society and the world. Wang, Gucci, J.Crew, and Louis Vuitton. collaborate with MA Fashion Studies peers. credits and a minimum of 15 elective credits. TOP: Ryota Sato, Why is the Internet so slow. Video, rocks, digital images, drawing, aluminum extrusion frames. MIDDLE: Photo of the 2017 MFA Fine Arts thesis exhibition, Second Nature. BOTTOM: Lisa McCleary, Corp Agus Fuil/Body and Blood (2018). Oil on aluminum, threaded rod, steel, concrete, 4 x 7 x 10 ft. FACING PAGE: Layo Bright, Must Go. High-density foam, Ghana-Must-Go fabric, Dutch-wax print, rope, tassels, cotton, silk. The piece was recently recognized with the Outstanding Student Achievement in Contemporary Sculpture Award from the International Sculpture Center. TOP: The program is housed in the newly renovated Cooper Hewitt, Smithsonian Design Museum. Shown here are students researching in the National Design Library, North Reading Room. BOTTOM: Cooper Hewittâ&#x20AC;&#x2122;s collection of more than 250,000 objects and its worldclass library offer Parsons students unique opportunities for curating and interpreting design objectsâ&#x20AC;&#x201D;and reaching new audiences. available to graduate students across The New School. It addresses the intricate relationship of design to society and investigates the social, political, and ethical facets of design from a future-oriented perspective. Students in the HDCS program who declare the graduate minor in Design Studies can choose to pursue their capstone with a design studies orientation. Students graduate prepared to work in some of the world’s most prestigious nonprofit, commercial, cultural, and academic institutions. industries that produce them as well. the quality of life for all. TOP: Lisa Marks ’17, fruit bowl made from “knitted” laser-cut bamboo veneer, created for the program’s Global Production studio course. MIDDLE: The design of Spiraloop, a vegetable masher created by program director Rama Chorpash, engages the production processes of a Brooklyn spring manufacturer. The product embodies the kind of decisions contemporary designers can make to influence systems involving employment, production and sustainability, and distribution, thereby advancing the field along responsible paths. BOTTOM: Parsons students and an in-house strategist at Poltrona Frau—a luxury furniture producer and frequent collaboration partner—explore the materials proposed for a competition project. that display video projections made by community residents to tell their own stories. 3D model on Rhino, rendering on Photoshop and Illustrator, physical collaging by hand and scanning. BOTTOM: Joel Rice, Portal. A stripped interior corridor from the Neponsit Health Care Center melds with the landscape of 120 years from now, when it is re-inhabited. Model photography, graphite, digital and physical collage. a tool for shaping experiences. the history and theory of interior design. Students supplement core classes with electives offered throughout Parsons and in other New School colleges in fields such as design and technology, anthropology, psychology, and environmental and urban studies. to the individual MFA Interior Design and MFA Lighting Design programs as well. social impact of lighting design. light, architecture, and interior design. and MFA Lighting Design programs as well. automatically be considered for admission to the individual MFA Interior Design and MFA Lighting Design programs as well. TOP: James Clotfelter, Silvia Mazzarri, and Jordana Maisie, Atrium electric lighting visualization. MIDDLE: Access to the Lighting Labâ&#x20AC;&#x201D;a resource unique to this Parsons programâ&#x20AC;&#x201D;lets students take varying lighting conditions into account in their designs. BOTTOM: Eby Vincent Mathew and Joanna Filter, Beat Beam. TOP: Craig Callison, Desktop_003 (2014), pigment print. MIDDLE: Charlie Rubin, Red Rock Painted Truck Purple Tree. BOTTOM: Lara Atallah, The Abandoned Dinner Party (Coffee Time). with visiting artists, curators, and critics. The school’s long-standing ties to the photography and art communities offer students access to New York City and international partners for internships, exhibitions, research, and representation. or study both on campus and online. primarily online and with week- and weekendlong intensives in Paris, New York City, and China. Students can complete study while working full-time. organization designs for creative industries. founder/CEO, LOVESAC Designed for Life Furniture Co.
TOP: Students share their research at a public event held at Brooklynâ&#x20AC;&#x2122;s Industry City. MIDDLE: Students in the recent Designing Thoughts workshop, led by trend analyst and program visiting fellow Zuzanna Skalska, learned about new economies, their effects on society and commerce, and the value of global awareness. They were then asked to imagine future business challenges and develop creative responses to them. BOTTOM: Through realworld projects, students in the program develop skill in translating the perspectives and needs of various teams involved in business management. TOP: Students explore textile working methods, including traditional weaving, in courses and learning experiences on-site at NYC studios. MIDDLE: 3D printed textiles offer designers a new way to shape fabrics and produce in limited runs for a range of industries. BOTTOM: Magnhild Kennedy, Stikker. The program prepares students to work with textiles in industries ranging from aerospace to interior design and from fashion to textile art. arts; architecture; and hybrid fields. producers add dimension to your learning. design—and represent a major growth field. explore high-tech and bio-tech production. best practices rounds out your learning. major form of cultural expression. in architecture, urban studies, or design. TOP: Fernando Canteli de Castro, Diagram of the NonProfit Industrial Complex. Students learn about the complexities and challenges of bringing about urban transformation in collaboration with local stakeholders and the nonprofit sector. MIDDLE: MA Theories of Urban Practice students Renae Diggs (left) and Joy Alise Davis (center) interview residents near Diversity Plaza in Jackson Heights, Queens, for their research. BOTTOM: Urban spaces with intertwined social, economic, and environmental problems are often the focus of student investigations and projects. Here students are guided on a visit to the South Bronx by local community members and experts. TOP: Sophie Riendeau, Ankita Roy, Juyeon Lee, The Emotion Invasion Lab. This group thesis aims to humanize medical practice by developing young physiciansâ&#x20AC;&#x2122; capacity for empathy and introspection while they are still in training. The end goal: to fight physician burnout through changes to medical curriculum and design alterations to clinical spaces. TOP RIGHT: Doremy Diatta, Material Communications. For her thesis, Diatta developed objects for parents of children with disruptive behavioral disorders to use at home to practice techniques learned in therapy. With support from Parsons, Diatta presented her thesis at the 2015 Design Indaba conference in Cape Town, South Africa. BOTTOM: Howard Chambers and Bland Hoke, Softwalks. Softwalks is a set of easy-toinstall components that uses construction scaffolding to support seating, plantings, and lighting, fostering social interaction in a greener urban landscape. Softwalks won Fast Company magazineâ&#x20AC;&#x2122;s Innovation by Design Award (Student Category). and effect positive social change. challenges such as restructuring healthcare services; as project leaders for nonprofit organizations; and establishing their own design consultancies and microbusinesses. 1. MFA Industrial Design Tim Ronco’s Electric Kettle Model 101 the Joule, developed for the New York Kettle Company, is manufactured in the region from long-wearing materials. Its detailing makes use richly experiential while hinting at the transparency of the product’s supply chain. 2. MFA Lighting design Min Young Kim’s Daylight & Shadow Parks takes inspiration from the atmospheric daylight of Central Park. Installed in a ceiling corner, her device filters light through dichroic glass and emits a range of colorful light-and-shadow patterns. 3. MFA Fashion Design & Society Mayako Kano collages historic and modern materials and techniques in a contemporary eight-look collection inspired by the Meiji period. Her pieces feature unusual proportions, unraveled and overpainted fabrics, and low necklines and waistlines. Embroidery unifies the collection’s looks. 4. MFA TExtiles Among the first of its kind, this new program guides students in the exploration of textiles—such as the 3D material shown at left and the hand-knit and embellished fabrics shown at right—and in the study of textile theory and the expanding array of textile-based industries. 5. MS Data Visualization Aseem Agarwal’s interactive digital project, How is Delhi Slowing Down?, employs hexagons to measure and depict traffic congestion. His tool is designed to help urban planners and analysts work effectively in one of the world’s most crowded and congested cities. 6. M.Arch Architecture Battery Grange, a thesis by Raquel Richter, reimagines 14 acres of coastal parkland as a space dedicated to urban farming, recreation, and education about rising sea levels, urban resilience, and the human connection to waterways. 7. MFA Photography The Gods Life is an audio and photo series by Sarah Wang and Zuri Smith that chronicles the life of Smith’s grandfather Clarence Edward Smith—founder of the Nation of Gods and Earths, an esoteric school of thought that flourished in Harlem in the 1960s. 8. MFA Transdisciplinary Design Juyeon Lee, Chengcheng Teng, and Oliver Arellano created Vitality Rhythm, a project incorporating crop-monitoring technology, to spark dialogue about the relationship between humans and nature. The project features a plant fed with soil from Freshkills Park—once the world’s largest landfill— whose care fosters human empathy. 9. MFA Design & Technology In Danli Hu’s Touching the Void, haptic gloves enable users to interact with virtual objects. The project, which employs Leap Motion and Arduino technology, is aimed at exploring constructed realities and the ways humans form impressions of objects in their minds. New York City 11. MPS Communication Design Husani Barnwell developed a corporate identity and a comprehensive suite of cross-platform branding elements for Tonic Conference, an event designed to convene young changemakers working in health and wellness industries. 12. MFA Fine Arts Paulina Kim Joo created a series of artifacts and artificial landscapes, including The Old Capital (2017), shown here. Her creations employ installation, video, and photography to explore the homesickness and loss of tradition caused by forces of globalization. 13. MS Strategic Design & Management Marcio Oliveira Silva’s United for Innovation System is a strategic plan that helps organizations achieve desired team performance by bringing together people with different backgrounds and capitalizing on the diversity of their ideas. 14. MA Fashion Studies Anthony Palliparambil, Jr.’s Floral Flaneurs: Flower Beards and 21st Century Masculinity on the Internet proposes new conceptions of masculinity through the decorated beard, inviting men to adorn their facial hair with materials traditionally considered unmasculine. 15. MA Theories of Urban Practice Anna Nichole Gorman’s thesis, The Fight for Los Sures: Tracing Welfare Policy “Reform” and Resistance to Displacement, explores the relationship between federal social welfare policy and urban displacement in north Brooklyn and proposes more equitable alternative systems. 16. MA history of design & Curatorial Studies Jacqueline Sullivan’s thesis, “All That Concerns Us”: The Art and Life of Trude Guermonprez, sheds light on one of the most influential practitioners and educators of the 20th-century fiber art movement. Sullivan analyzes Guermonprez’s complex weaving techniques and their role in her work. 17. MFA Interior Design Maria Claudia Narvaez Arango’s Space and Empathy: Design of a Hospital Patient Room for Emotional Well-Being examines the ways spatial arrangement can influence a person’s well-being and applies interior design strategies in reimagining the traditional in-patient hospital room. 10. MS Design & Urban Ecologies Jakob Winkler’s thesis project, Critical Cartographies of Change: Resisting Urban Renewal Through Radical Mapping, is a printed map and accompanying interactive version that aid readers investigating state-led renewal policies that forcibly displace New York City residents. a place where community forms: Students and faculty collaborate and discuss creative challenges at the center’s many ample work tables. Interior Design and Cardozo libraries. At the Kellen Design Archives, you can explore Parsons’ celebrated history in studio disciplines and design studies. fashion sketches, articles, photographs, and recordings. programming as part of their coursework or by invitation. to develop customized solutions that drive innovation and help businesses thrive in a complex, diverse global economy. Listed at left are some of our recent partners. TOP: Parsons’ Making Center— more than 25,000 square feet of cutting-edge and traditional creative tools and workspaces—fosters collaborative work, hybrid making, and innovative manufacturing processes. MIDDLE: Libraries in the University Center building and on East 16th Street include quiet study rooms and spaces for group work. BOTTOM: Parsons’ galleries— such as this one in the Sheila C. Johnson Design Center—have large windows that face the street, inviting the public to take in exhibitions and programs. omy Photography Expanded: Counter-Histories Gun Reform in Black & White: Student Activism and #NeverAgain Conference on Cities, Climate and Migration Stepping Outside the Frame: Meet the New GeneraTOP: The Tishman Auditorium in the University Center, shown here, is a venue for public programs that bring thought leaders and innovators to campus, extending learning beyond the classroom. MIDDLE: The New School Art Collection’s newest commission, installed in the University Center, is a wall drawing by pioneering conceptual artist Agnes Denes. BOTTOM: A student creates a composition using samples from the Healthy Materials Lab’s library of nontoxic products such as rubber flooring, tile backing made from reused juice boxes, and flooring made from linseed oil, wood flour, and jute. Also shown are eco-fabrics created in a collaboration with Tide detergent. spaces of The New School. Pioneering works from the collection of nearly 2,000, including pieces by Martin Puryear, Adrian Piper, and photographer and New School teacher Berenice Abbott, are found throughout campus, offering you moments of inspiration and discovery. creating critical change in the world. In downtown New York—a celebrated hub for creative minds. attendance For up-to-date information on tuition and fees, visit newschool.edu/tuition-and-fees. (the New School/Parsons code is 002780). grants that can be applied to graduate study.  pplications received after January 1 may be considered A if space is available in the program. Late applications may be less competitive for scholarship consideration. »»Research non–New School scholarships. »»Register for the TOEFL or GRE if needed. »»Contact those who are writing recommendations. »»Apply for the fall/summer term by January 1 (priority scholarship deadline). »»Check your application status online at newschool.edu/admissionhub. »»Check for admission decision letter, sent out in mid-March or later. »»Meet faculty and alumni at events for admitted students. »»Explore housing options. »»MFA Photography students begin class in early June. »»Register for classes. »»MFA Design and Technology students attend Bootcamp in late July. »»Attend orientation. »»Classes begin in late August. See website for locations. International transcripts require additional time for English language translation. Applies only to students who meet federal eligibility requirements. School community. 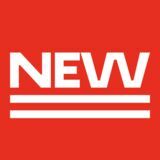 To learn more, visit newschool.edu/university-center. Unravel it and start from scratch. The Professional Studies Diploma (PDPL) is an advanced certificate program open to students who have completed an undergraduate degree. The New School offers a range of programs. See details at newschool.edu/academics. This brochure is printed on 100 percent post-consumer recycled paper with UV inks that conserve energy and material and do not release VOCs into the atmosphere— reflecting the university’s embrace of environmental responsibility.